There was a priest in Little Hormead when the Domesday Book was compiled. (No priest was recorded in Great Hormead.) Our modest Church of St Mary the Virgin was built over several years during the 11th and 12th centuries, probably on the site of an earlier religious edifice, as so many Norman churches were. It has a narrow nave and a wide chancel arch in a lovely, simple Romanesque style. Incidentally, the Royal coat of arms still above the arch showed that during the Commonwealth Little Hormead inhabitants retained strong royalist sympathies and were not afraid to show it. All St Mary’s walls are immensely strong for its size, almost 3ft thick in places. The most unusual feature of the church is the original north door, the entrance now blocked up, with its original wood and iron strapwork and iron nails. 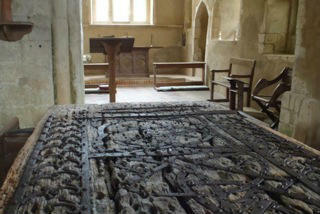 It has survived since the late 1100s in a rare state of preservation and is currently being restored. Of the two bells in the turret, one is over 2ft across and among the oldest in the county; made around 1400 it is inscribed ‘Sancta Maria, ora pro noblis’. And on the wall by the south door there is a roughly-incised head with a 15th century head-dress, probably cut by a passing pilgrim on the way to Walsingham. Grade I listed, the church has no means of lighting, apart from brought-in oil lamps and candles. The parish was combined with Great Hormead in 1886 and although still consecrated it has since 1995 been in the care of the Churches Conservation Trust (CCT), a charity that enables those churches no longer needed for regular use to ‘retire gracefully’. The Trust is working to reinstate the door in its original niche. St Mary’s is still used for occasional services. The churchyard is not in the care of the CCT but the incumbent, and one part of it is presently being transformed by residents from an overgrown wilderness with occasional mown areas around later gravestones to what will be a wild flower meadow, with cowslips, oxeye daisies and meadowsweet, and a continuing haven for wildlife.